Anna blamed lack of media coverage for thinning crowds as hardly a few hundred people turned up for his hunger strike at Ramlila Maidan Monday. New Delhi: Three days after Anna Hazare began his second indefinite hunger strike in New Delhi, the central government Monday sent a representative to talk him and look into his demands. Girish Mahajan, Maharashtra water resources and medical education minister, met Hazare at Ramlila Maidan where the strike is underway. He assured Hazare that he would be back on Tuesday after discussing the demands with senior leaders of the party. At a press conference after the meeting with Mahajan, Hazare said the hunger strike would not be called off unless the government gives concrete assurances about the time it would take to fulfil each demand. “If the government doesn’t do it even after giving it in writing, the doors of coming back to Ramlila Maidan are always open,” Hazare told ThePrint. Hazare has been on strike in Delhi since Friday with three main demands: the appointment of a Lokpal, better policies for India’s farmers and electoral reforms. But the response to his campaign has been indifferent, with even opposition party members not meeting Hazare during the strike. 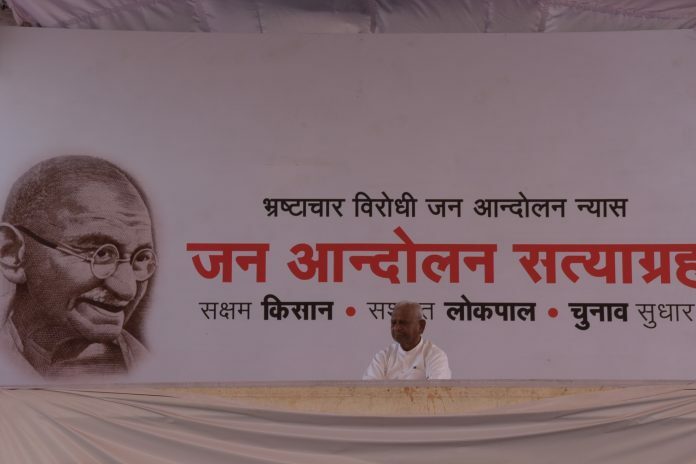 “This time the opposition parties, especially Congress and AAP, have not made any attempt to meet Anna so far,” said Shyam Pathade, secretary of Hazare’s NGO Bhrashtachar Virodhi Jan Andolan Nyas. The turnout has been receding since Friday, unlike in 2011 when large crowds had joined Hazare’s anti-corruption campaign. On Monday, there were about 300 people at the venue compared to about 2,000 on Sunday. “The people of Delhi are not showing interest and it is very difficult for the new team to pull people,” a member of Hazare’s team told ThePrint the condition of anonymity. Hazare blamed the media for not giving people enough coverage of the event. “Last time there were 70 cameras covering the event, this time only a few,” he said. The member of Hazare’s team said that after the “betrayal” by Arvind Kejriwal last time, it was difficult for them to convince people about the sincerity of the movement. Kejriwal had split from the movement in 2011 to form the Aam Aadmi Party and contest elections. “Irrespective of what you say, Arvind Kejriwal and Manish Sisodia have worked for long in Delhi, they had resources to mobilise people,” he added on the success of the movement in 2011. The lack of popular faces on stage with Hazare is not helping with the thin crowd either. “It is hard for us to recognise the people in the core committee this time. None of them are mass faces. They are good and grass-roots people but in this age and time, you need people who can pull crowds,” said the member. It feels almost as if the government feels pity for him.